Icy's Blunt Pencil: Are digital magazine subscriptions the future? I came across this post on the io9 blog, and actually went "SQUEE!" when I read the announcement. 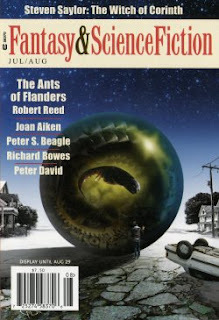 It seems that the seminal fiction magazine, The Magazine of Fantasy & Science Fiction, is going digital. It'll be available for the Kindle, with both a stripped down free option, or a subscription to all of the content for just $12 a year. Yes, that's six issues for $12. By comparison, the print version of the same subscription is $35.97. In the UK, it'll cost 99p a month for the digital subscription. To be honest, I think digital subscriptions are the way forward. As most people know, I'm in the process of packing things up ahead of a big move, and the storage of magazines is a real headache for me. Yes, it's nice to be able to flick through things but once I've read it, what do I do with it? I don't always want to recycle the issue in case I want to refer to it in future but there comes a point where you're just storing an awful lot of paper. To me, digital solves the problem. I can access an archive whenever I want, but I don't have to worry about finding the space to store physical copies. Besides, you can't argue with a price like that - effectively £1.98 an issue! I used to subscribe to The Magazine of Fantasy & Science Fiction a while back but I didn't renew precisely because I was paying a lot of money for something I couldn't find the room to store. Now I can have it delivered to my Kindle app on either my Netbook or smartphone, I might just subscribe again. It stands to reason that if I can be swayed, so can others, and getting people to read short story magazines can only benefit writers. What do you think? Do you think digital subscriptions will help bring people back to short fiction? I think there is a huge possibility that with digitization will return the desire for short fiction--people likes good things for which they don't have to pay much, this might provide just that. Thanks for posting this! I'm getting my subscription today. And yes, going digital IS the way there journals and magazines need to go. Magaly - That's what I'm hoping too. Michael - Wahey, glad I could help! I love this! I can't wait to get my digital subscription. And yes, I do believe digital will get people reading short fiction. I've already seen it with the CW anthologies & Flash Fiction. The convenience of having the latest issue sent straight to your Kindle plus the cost saving is a win-win to me. Already subbed on my Kindle to One Story and Electric Literature. Digital magazines are definitely the way to go. Digital distribution is a necessary part of publishing at this point. It's not the exclusive future, at least not immediately - I took the train home tonight and saw twelve paperbacks being read versus one tablet - but it's formidable. For smaller pieces of content like magazines, digital is even more appetizing. I'm surprised that more scifi magazines haven't already jumped onto such formats and distribution. We are supposed to be the tech-fetishizing nerds, aren't we? I run eFiction Magazine on the Kindle and we are definitely the future!! We are doing crazy new things in this new medium and pushing the boundaries. Check us out!! Jen - Oh I'm totally subscribing - at that price, it would be rude not to! Dan - I want to say it's more environmentally friendly but naturally there's the environmental cost involved in making the devices. Still, it beats having all that paper just lying around. John - Oh I still see a lot more books than e-readers but I think the tide is turning, especially with the e-reader apps on smartphones. Like, I don't need to buy a Kindle because I have the app on my new phone. It's making my life a lot easier, having these books at the touch of a button, instead of needing to find storage space. Doug - Links!! Promote yourself! http://www.amazon.com/eFiction-Magazine/dp/B004UD88K2 is our amazon page. Hope you enjoy our stories! Most of the magazines I read these days, I read on my computer. It's just easier.